OK I found my last late night error. I think Nick made the false statement that the photon has infinite redshift when it leaves us along our future light cone and hits our future horizon. See below. Actually Z, the effect I am talking about does not require far-field propagation of on-mass-shell blackbody photons to infinity. "What is more controversial is whether or not this implies that the system actually radiates." in order to get the Wheeler-Feynman total absorber condition. Not obvious this can happen. Now what about the static LNIFs? When I was at Birkbeck College, University of London in 1971, David Bohm once said to me that "General Relativity has a complete theory of measurement, while quantum theory doesn't." I think he meant the Wheeler approach that is detector-centric. If you cannot formulate the GR in terms of small detectors in a gedankexperiment you quickly get lost in the opium fog of pure mathematics leading you off the true path to Paradiso in Dante's sense. Look I understand what Gibbons and Hawking are trying to do. They are working from a formal thermodynamic analogy between black hole and cosmological event horizons, and are proposing a quantum theoretic model for the thermodynamics of cosmological horizons which involves the detector-dependent creation of particles. My question is about whether such an acceleration-dependent model for the thermodynamics can be given a generally covariant description GCD within the framework of GTR. What do you think? Tricky question because GCD assumes a unique vacuum classically, which is not true quantum mechanically. Look at Susskind's horizon complementarity. The real on-mass-shell particle content is a function of the covariant tensor acceleration of the detector. One must use Bohr type approach in GR as well as in QM i.e. "total experimental arrangement" as soon as quantum effects like Unruh effect become important. There is too much formal math in GR without any real anchoring in experiment. Not enough Bridgman operationalism. The Wheeler-Thorne school is the exception to this of course. Well of course I think *you* still don't get it. The effect is reciprocal. :-) Of course the Unruh phenomenon depends on the acceleration of the detector. The question is whether such effects are objective and can be thus separated from frame artifacts. The effect is objective. In my model, which may not work BTW, the virtual electron-positron pair is the accelerating detector because its stuck at the event horizon, whether objective or observer-dependent won't matter. In the de Sitter observer-dependent case the photon emitted from the observer who is always at r = 0 when g00 = 1 - / ^2 sees a stuck e+-e- pair (static LNIF) at distance H from its (the photon's) horizon. past emitter is at r = 0, future absorber is at tiny H from r = /^-1/2 Your MTW "LNIF" is a chimera, since it bundles objective acceleration-dependent effects (represented by tensor invariants) with frame artifacts (represented by the *components* of 4-tensors). This is radially outward pointing, since the observers need to accelerate away from the object to avoid falling toward it. On the other hand, the spatially projected Fermi derivatives of the spatial basis vectors (with respect to ) vanish, so this is a nonspinning frame. note that the /^1/2 term is like the hf/2 zero point term in the quantum oscillator - call it the horizon surface gravity Hawking radiation term missing from Einstein's classical calculation. There are a number of papers arguing that there is no actual Unruh radiation, and that the Unruh temperature seen by an accelerating detector is an effective temperature, but otherwise the physical situation is exactly the same as that experienced by a non-accelerating observer at the elevated temperature. What impact if any would that have on your Wheeler-Feynman model for cosmological horizons? It would destroy it obviously. That is a good thing. My model is Popper falsifiable, unlike many archive papers. There is another reason that my model may not work, but I am not sure yet. What is the temperature of black hole and cosmic horizons really? However, it looks as though we need H ~ Gm/c^2 ~ 10^-56 cm to get T > 2mc^2 and this is problematical since it's much smaller than the Planck length Lp ~ 10^-33 cm. It depends how close you are to it as a static LNIF. Here is one important idea that Nick got hung up on. g(r) = (c^2/rs)(1 - rs/r)^-1/2 ----> infinity at the black hole horizon for static LNIFs hovering outside it. Of course a geodesic LIF falling through the horizon sees T = 0 because its covariant acceleration is zero. The photon is a null geodesic LIF, but the virtual electron-photon pairs clamped to the relative horizon of that retarded photon emitted from r = 0 are static LNIF with covariant acceleration c^2/^1/4H^-1/2. Hey Z, please copy and paste the specific Greene text. Where, faint at best, the beams of Science fall. I did not pay attention seeing Nick Herbert just used it as bait to throw Red Herrings at me. and as usual has little patience for novices. about Brian Greene's NYT article. I was thinking more along the lines of what do you think it man for the world of UFO researchers. But we can avoid that. Idle speculation at this point - you need to ask Jacques Vallee, Stanton Friedman and Nick Pope who were there. However, I wonder if you have any opinions/thoughts about theories concerning parallel universes and possible portals between them, portals that either open or close by themselves or, possibly, can be opened or closed. Yes, I have been very clear on that since the discovery of dark energy repulsive gravity. The only way real material ETs from distant places and times can reach us is with star gates and warp drive. Stargates can connect Max Tegmark's Level 1 and Level 2 parallel universes of course and warp drive can connect different Level 1 parallel universes. Also there is general confusion about parallel universes. Brian Greene himself may be confused I'm not sure. There are at least THREE different meanings to the word obvious from Max's picture above. I would like to ask you about your views on the Saudi conference. Are they trying to be an alternative Ted or are they onto something? Bill, I was not there and have no views as yet because I have no information on what happened. Of course it's significant that they were invited in the first place to talk about the subject. I don't want to talk about other people's physics ideas. My own are exciting enough. Good questions to ask me. What is the hologram universe? How does signal nonlocality relate to ordinary consciousness and to the remote viewing experiments of the CIA at SRI? What about the experiments of Bem at Cornell that seem to confirm Bierman's and Radin's presponse experiments on back from the future messaging? President Obama just gave Yakir Aharonov a medal for his back-from-the-future quantum theory. How does Yakir's theory relate to what you have been saying since the 1970's? How does that connect to the sudden rude disinvite by Antony Valentini and Michael Towler to you, Nobel Laureate Brian Josephson, and David Bohm's biographer David Peat because of their politically incorrect interests in consciousness, the paranormal, UFOs, and your unconventional non-academic style of presenting your ideas on the internet bypassing journals - though not entirely. We're go for tomorrow. Will go up sometime tonight or tomorrow. A misconception about the equivalence principle and the gravity frequency shift? One can do a simple experiment at the space station to test all this in a new way and detect horizon complementarity - more on this another time. The Pound-Rebka experiment is between two static LNIFS. Jefferson laboratory at Harvard University. The experiment occurred in the left "tower". The attic was later extended in 2004.
so we see that the gravity redshift on spectral lines emitted from the surface of the Sun to Earth is only of order 10^-8, i.e. megaHz for visible light. The Earth is on geodesic orbit in the curvature field of the Sun. So there are two more approximations here. Even though the Earth is LIF in the Sun's curvature field we approximate it it like a static LNIF. Note that a static LNIF becomes LIF as r ---> infinity. We see that this approximation only makes a 1% error in the coefficient of the major contribution to the shift of 10^-8. We also neglect the covariant acceleration of the detector on Earth's surface of g ~ 10 meters/sec^2 in the curvature field of the Earth. 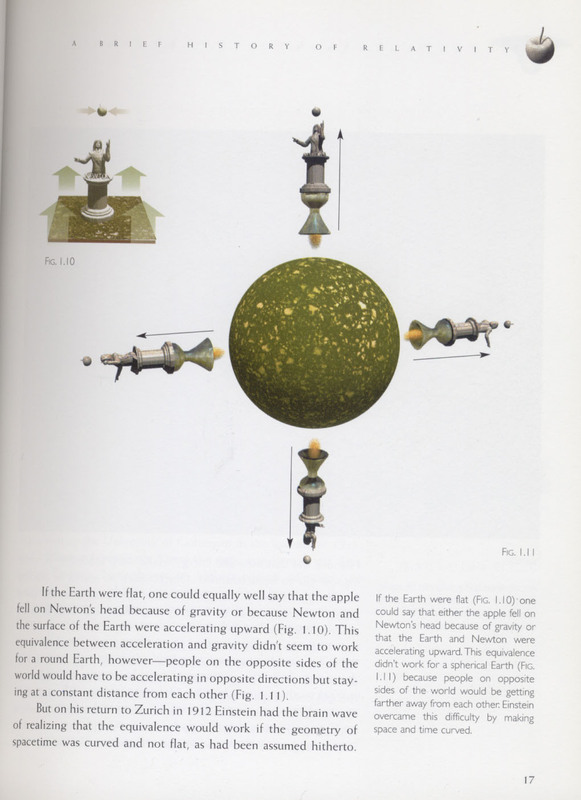 Note that the curvature field of the Sun at Earth is of order 10^5/(10^13)^3 cm^-2 ~ 10^-34cm^-2 i.e. curvature radius of 10^17 cm. The curvature field of the Earth at the surface of Earth is of order 1/(10^9)^3 ~ 10^-27 cm^-2, i.e. curvature radius of ~ 10^13 cm. Your problem Z is that you simply do not look at the diagram. Pick any vertical (constant co-moving coord) world line you like. The Copernican principle is obeyed. Its past particle horizon is its future light cone at a(0) = 0. Retarded light in our past cone from the past particle horizon is infinitely redshifted. Light rays at 45deg & 135 deg on this conformal diagram. Its future event horizon is its past light cone at a(infinity) = infinity. Advanced light from this horizon back to us at r = 0 is infinitely redshifted, but retarded light from r = 0 to it is infinitely blue shifted (classically). Here t = proper metric time not the conformal time tau. 1) assume only retarded light signals. Therefore, we only detect at a point stuff on the past light cone of that point. 2) Now we have a choice. 2a) the future horizon is not a total absorber, so we can see retarded signals from Galaxy X even when we are beyond Galaxy X's future event horizon. 2b) the future horizon is a Wheeler-Feynman total absorber from the real electron-positron plasma therefore no light rays from r = 0 make it past its future horizon. In that case, and only that case is Nick right in one of his statements. Only photons emitted from r = 0 see the plasma at their horizon r = /\^-1/2. LIFs do not see it. The blue shifted photon relative to the LNIF virtual electron-positron pairs clamped to the the r = /\^-1/2 horizon (of thickness Lp) provides the energy needed to pull them out of the vacuum in accord with the Unruh temperature T(r) = hg(r)/ckB. Nick is mistaken that a retarded photon from r = 0 is infinity redshifted. In fact, its the opposite, its infinitely blue shifted for a static LNIF detector clamped to the horizon. Not so for a co-moving detector because of horizon complementarity. Basically the co-moving detector in de Sitter space has acceleration 0, i.e. LIF, but a static LNIF detector has acceleration g(r) = 2c^2/\r(1 - /\r^2)^-1/2 ---> 0 at r = 0 and ---> infinity (classically) at r = /\^-1/2. 1) where did you get the equation of cosmic acceleration as function of H? i.e. g00 = 0 is the horizon relative to the observer at r = 0.
i.e. geometric mean of distance H to the classical horizon surface with square-root of area/entropy of that surface. 2) where does that preposterously small distance L(p) = 10^-33 cm come from? That comes from Lenny Susskind's "stretched membrane" horizon and basic quantum gravity Heisenberg uncertainty of the metric fluctuation - quantum fuzzy thickness of the classical horizon. Actually Martin may still only need six numbers since the numbers here are derivative as long as he has the Hubble scale as one of the six. If the observer carries a net surface charge his virtual photons will couple to the virtual electron-positron pairs it seems and he may no longer be a LIF. We seem to be getting to something like George Chapline's dark star? Maybe nothing can get through the black hole surface and it all smears over the surface as in Lenny Susskind's picture above? Not sure about this. This does not happen in the subjective cosmological horizon obviously. Does Martin Rees need seven numbers not six? Not just SIX NUMBERS but SEVEN? Just six numbers govern the shape, size, and texture of our universe. If their values were only fractionally different, we would not exist. Curiously, using Lenny Susskind's Lp thickness from quantum gravity, our FUTURE horizon is just the right size to get an electron-positron plasma at an Unruh temperature of 2mc^2. "That is not what Nick is talking about. He is saying that if we are located at a remote observer's future horizon, not only will light emitted by that observer's galaxy at some point in the distant past not be able reach us after we cross that observer's horizon,"
Look at Nick's version centered at Galaxy X at z = 0. Let us be on redshift world line z = 1 relative to Galaxy X's z = 0. This is symmetrical. You can interchange "us" and "Galaxy X" to get my original diagram. We cross Galaxy X's future event horizon at a(t) somewhere between 1.5 and 2.
then and only then will source X suddenly disappear from our past light cone when we pass through source X's future event horizon because no photons from it will penetrate the real electron-positron plasma barrier. We do not see that plasma when we pass through through source X's future horizon all we see are the virtual electron-positron vacuum polarization zero point fluctuations. This is the Horizon Complementarity inherent in the Unruh effect that the real/virtual particle divide is dependent on the intrinsic tensor acceleration of the detector. "but light emitted by our galaxy *at the same time* in the distant past will not be able to reach the remote observer. So we can locally experience the entire event. The effects are reciprocal." For sure all the effects are reciprocal. The Copernican Principle is not violated. Z, I don't understand your final portion because I don't know what you mean by "the remote observer" - draw the diagram. Also I don't know what you mean by "at the same time." "Davis is right, this really is a confusing subject." Nick mistakenly thinks of / de Sitter horizons like the black monolith of 2001 sitting there in space the same for every detector. That is not the case. The / horizons from dark energy depend on the quantum vacuum structure and that changes for different detectors with different accelerations because of the Unruh effect. The future / horizon dense hot plasma for Galaxy X is only real for photons emitted by Galaxy X not for us momentarily passing through it at same time and place as the photons. This is different from the black hole case where the horizon is not observer-dependent in the same way. "I agree, Z. As we pass through its future horizon the light from Galaxy X would, from our point of view, simply vanish (probably infinitely red-shifted). Even tho we are exactly present at the future horizon of Galaxy X we would see no plasma sheaths, no electron-positron pairs, no photon mirrors, nothing at all." Nick, your error is assuming that everyone must see the same thing. You don't understand horizon complementarity and the inequivalent quantum vacua for detectors with different accelerations of the Unruh effect. Of course we at Galaxy X's future horizon do not see any real plasma as I said many times already. Only the photon from Galaxy X sees that plasma. f(r) = f(0)/(1 - / ^2)^-1/2 ---> infinity at the future horizon for static LNIFs at fixed r, e.g. the virtual electron-positron pairs stuck at r = /^-1/2 where g00 = 0.
f(r) = 1/ds(r) = f(0)/g00(r)^1/2 ~ kBTUnruh . Lenny Susskind explains all this. Here is where you are confused. You know that the black hole horizon is an infinite redshift surface. But that's for retarded photons leaving it arriving at us. The effect is reciprocal. A photon from us arrives at the black hole horizon infinitely blue shifted for the virtual electron pairs stuck to the horizon. the effect is reciprocal so any retarded photon from rs will have zero frequency at our detectors. You cannot use the co-moving metric representation where the photon wavelength stretches as the universe expands in the cosmology case for horizon problems. Comoving detectors are not the same as LNIF detectors (virtual particles) clamped to the observer-dependent / horizon. Nick, your statement is meaningless. You are not asking the right question. The right question is does anything special happen for WHO? In the case of observer-dependent cosmological / horizons nothing special happens for us if we are co-moving with zero covariant acceleration, but something special does happen for a photon from the source whose future event horizon we are crossing at same place and time as the photon. The virtual electron-positron pairs see that photon with a huge blue shift > 2mc^2 that pulls them out of the vacuum. "If Sarfatti and Ibison claim that all sorts of weird stuff happens at future horizons, then our descendants will certainly be in a perfect position to witness this weird stuff." No Nick because you don't understand the new physics here of horizon complementarity. L Susskind - 1993 "Leonard Susskind proposed a radical resolution to this problem by claiming that the information is both reflected at the event horizon and passes through the event horizon and can't escape, with the catch being no observer can confirm both stories simultaneously. According to an external observer, the infinite time dilation at the horizon itself makes it appear as if it takes an infinite amount of time to reach the horizon. He also postulated a streched horizon, which is a membrane hovering about a Planck length outside the horizon which is both physical and hot. According to the external observer, infalling information heats up the stretched horizon, which then reradiates it as Hawking radiation, with the entire evolution being unitary. However, according to an infalling observer, nothing special happens at the event horizon itself, and both the observer and the information will hit the singularity. This isn't to say there are two copies of the information lying about — one at or just outside the horizon, and the other inside the black hole — as that would violate the no cloning theorem. Instead, an observer can only detect the information at the horizon itself, or inside, but never both simultaneously. Complementarity is a feature of the quantum mechanics of noncommuting observables, and Susskind proposed that both stories are complementarity in the quantum sense. Interestingly enough, an infalling observer will see the point of entry of the information as being localized on the event horizon, while an external observer will notice the information being spread out uniformly over the entire stretched horizon before being re-radiated." However, there are some qualitative differences between the observer-independent black hole horizon and the observer-dependent dark energy / cosmological horizon. #1 We are outside black hole horizons and can receive retarded light from sources close to but outside them. #2 We are inside our past and future cosmological horizon. #3 Only our future horizon is a / horizon - not our past particle horizon. #3 The emission of a photon and its interaction with the future cosmological horizon is that of Susskind's stretched membrane horizon in an undivided Cramer transaction. "a streched horizon, which is a membrane hovering about a Planck length outside the horizon which is both physical and hot. According to the external observer, infalling information heats up the stretched horizon, which then reradiates it as Hawking radiation, with the entire evolution being unitary." The distant external observer and the local static LNIF virtual particles STUCK at the horizon both see a physical hot plasma from the Unruh effect caused by the huge blue shift of the photon from the emitter. However, a locally coincident unaccelerated geodesic observer with no connection to the emitter of the photon sees nothing odd - no hot plasma. "Since the Unruh effect depends only on acceleration and not on velocity and assuming that today's universal acceleration remains constant your homework problem for today, Jack, is to calculate the Unruh temperature corresponding to an observer (say the photon travelling from Galaxy X experiencing the effect of this cosmic acceleration. Number please, Herr Professor." Wake up and smell the coffee Nick. I gave that calculation in detail days ago. Here it is again. Because the light cone tips over so much I don't think a stable circular orbit inside the event horizon is possible - at least classically for a non-rotating black hole. note geometric mean of rs with H.